Aside from ‘vegetables’, and maybe ‘bathtime, there is no word more universally despised by kids than ‘educational’. But since there’s no age too young to start prepping them to get into a good college, these bedsheets provide a valuable geology lesson every time your kid heads off to bed. Available in twin or full-queen sizes for $189 and $219, respectively, the multi-layer sheets use a variety of different fabrics—like cotton percale, linen, gauze, and corduroy—to illustrate the different layers of the earth’s crust. 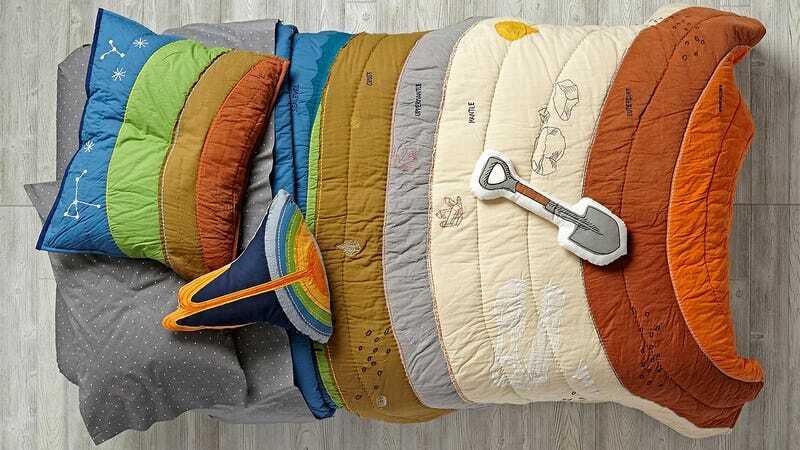 So even if they’re too young to read the embroidered labels on the quilt, kids will still get the idea that their planet is made up of a bunch of different materials.